This has been quite an odyssey for the princess Aisha Gaddafi. From Sorbonne-trained attorney and Claudia Schiffer-beauty to renegade in the Sahara and birth of a baby girl deep in the desert, the shift in her life could be fairly described as melodramatic. But the mystery surrounding the escape of Aisha, her mother, Safiya and two of the Gaddafi sons (her brother Hannibal and half-brother Mohammed) is proving most intriguing. First we hear that they were held up for 8 hours at the Algerian border near to the Libyan town of Ghadames before being allowed to cross. 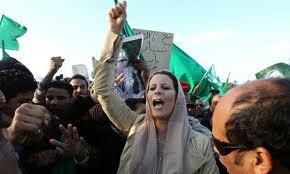 Then we hear that the entire Gaddafi family fled Tripoli in such a rush that Aisha even left behind her wedding pictures. The homes of the various family members looked to have been vacated on a moment’s notice. Apparently they had no idea the Freedom Fighters were coming. Seems implausible that they could be so isolated or delusional, but we have come to believe almost anything about this enigmatic family. Next is revealed the startling news that Col Muammar Gaddafi himself was with the long caravan of cars that attempted to cross the border, but that he was refused entrance to Algeria. Stranger still is the story coming from Algerian media that the President of Algeria, Abdelaziz Bouteflika, refused phone calls from Gaddafi asking for his help. Bourg Messaouda is across border from Ghadames Libya. Note how far south Djanet is. One: they did not cross at Ghadames, but crossed further south in an unknown sector. Likely at Tinkarine south of Ghat. 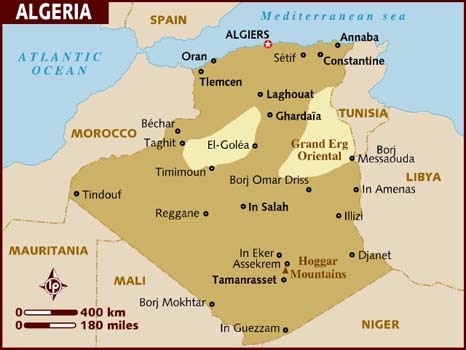 http://bit.ly/pxclbl Two: They were headed south out of Algeria to another country, likely Niger. Three: She didn’t have a baby at all, which some Libyans have suggested. Four: She didn’t have the baby at Djanet which is unlikely. There seems no advantage to invent that part of the story. Aisha named the girl after her mother, Safiya or Safia, by the way. Some of us were hoping for Mermaid Dawn or Desert Rose. Why is any of this important? Well, if the part of the story about Gaddafi being with the family is true, and the family crossed over at Ghat, it could mean that Gaddafi was much further south in Libya than anyone reckoned. Of course, they still could have crossed further north at Ghadames and then attempted to follow an escape route to Niger which might have been Gaddafi’s plan for himself. And might still be. There are so many parts of this story that don’t jive. I left out one part that has the group wandering around in Tunisia before finally finding the right road to Algeria. Whole saga reads like the pieces of a jigsaw that have been thrown up in the air and you’re not even sure if they’re all from the same box. Fund Definition:Fund Thesaurus » Could Gaddafi be hiding in deep desert Libya with his Toureg Praetorian Guard?